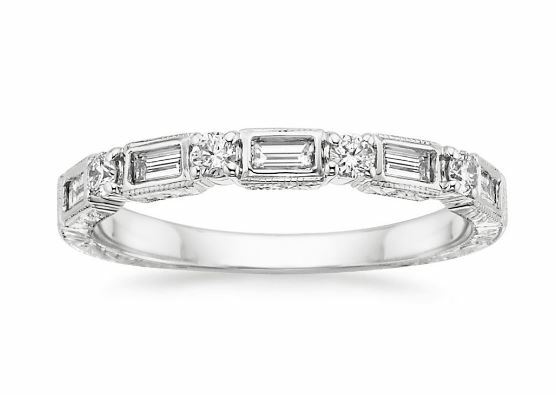 Harkening back to the Art Deco era, baguette diamonds make for a sleek and sophisticated look when set in wedding bands or engagement rings. 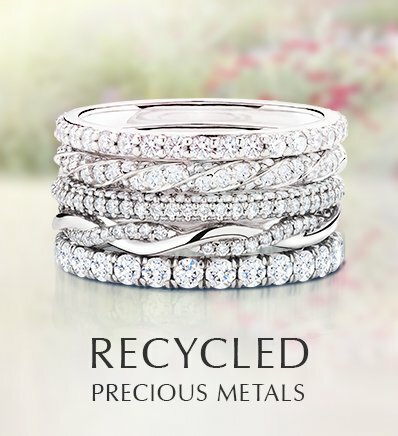 As their name alludes to, baguette diamonds are named for their long and slender shape. 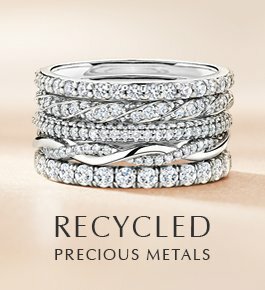 The use of clean lines and futuristic geometric forms were signature characteristics in Art Deco rings, reflecting the bold spirit of the roaring 20s. The streamlined geometric shape of baguette cut diamonds fits effortlessly into this motif. 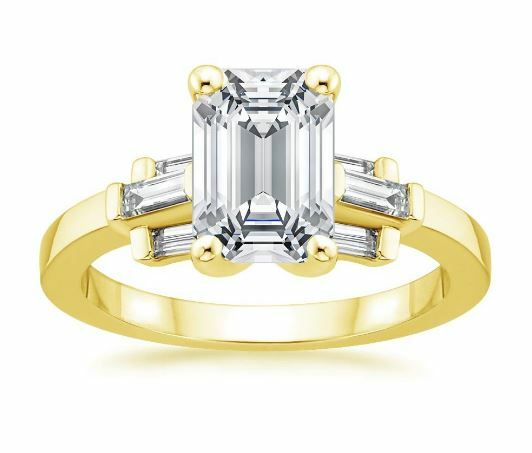 Today’s re-imaged baguette diamond ring designs have a vintage appeal that’s perfect for the modern bride. 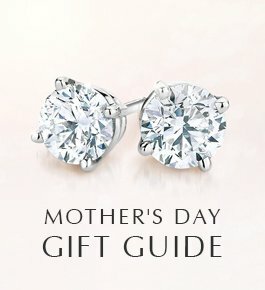 What is a baguette cut diamond? A baguette cut diamond is a step cut diamond. 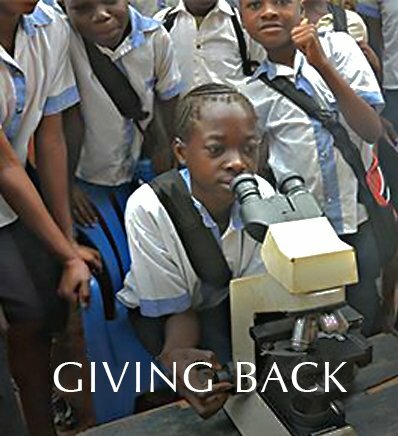 They are long and rectangular in shape and offer exceptional clarity. 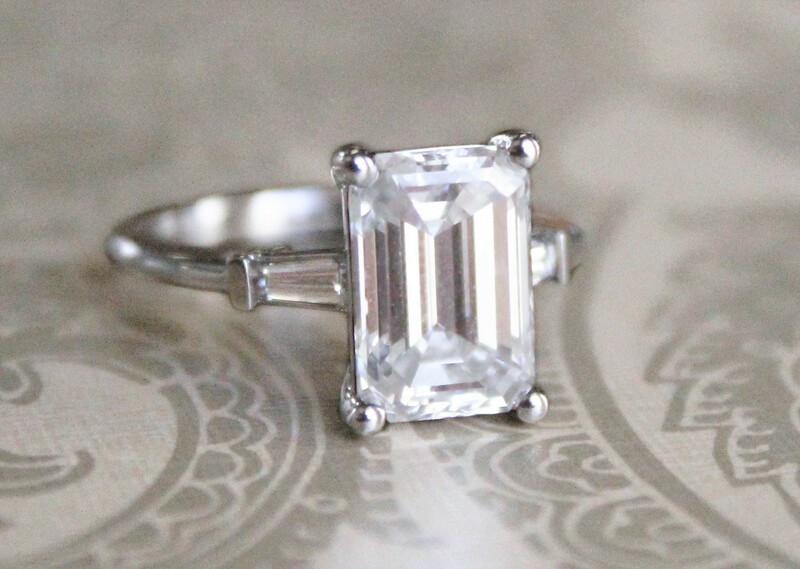 Baguette and emerald cut diamonds are known as step cut diamonds. 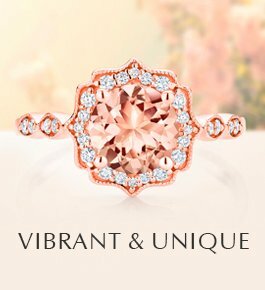 This cut offers a different type of beauty from a classic round cut diamond, offering exceptional clarity and a distinctive look when set in fine jewelry. Step cut diamonds are either found in square or rectangular shapes, and their facets are rectilinear (made up of straight lines). This cut’s long, narrow facets produce a prismatic reflection as opposed to brilliance, evoking a house of mirrors or a staircase look—hence their name! 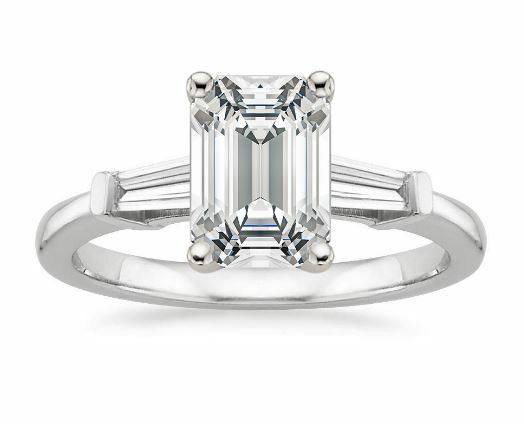 Emerald cut diamonds typically have 50-58 facets while baguette diamonds have 14. 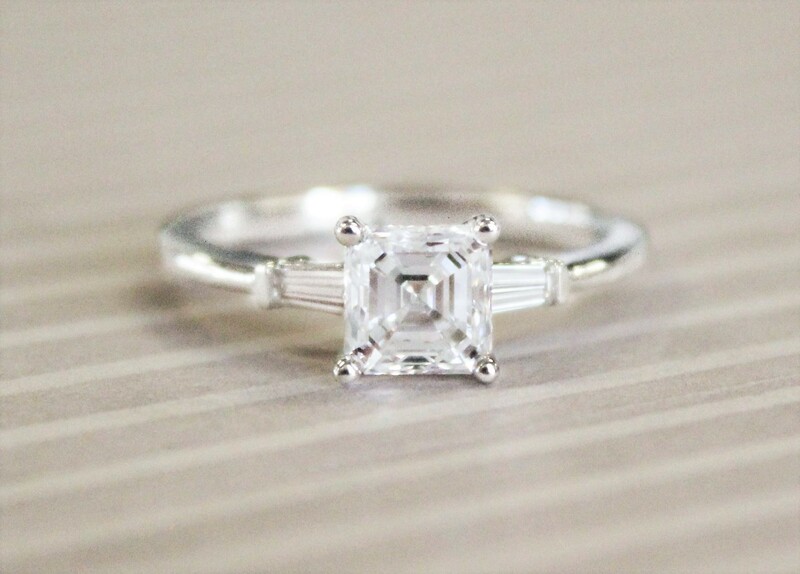 Emerald cut diamonds are often featured as the main stone in engagement rings and other fine jewelry. Baguette cut diamonds are commonly used as side stones to accentuate the beauty of a different shaped center gem. 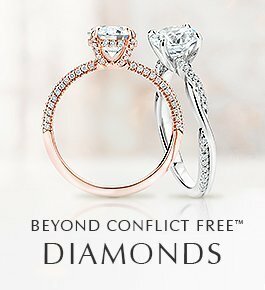 Straight baguette diamonds are perfectly rectangular with opposing sides being perpendicular to each other. 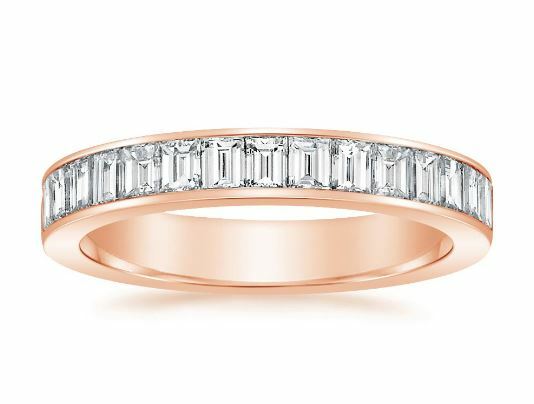 Tapered baguette diamonds are narrower on one of their two ends, creating a trapezoidal shape. Either type of baguette diamond looks exceptional when framing a center diamond, but we especially love the look of tapered baguettes in three stone rings! 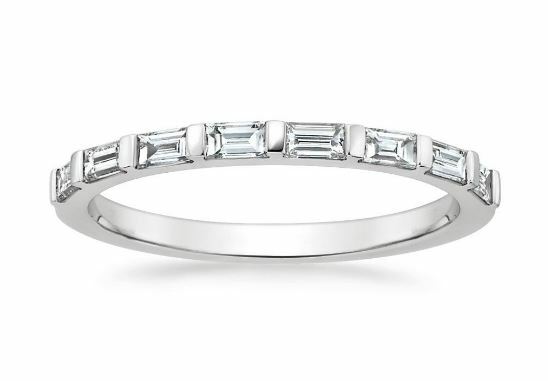 Captivating tapered baguette diamonds are bar channel-set in this elegant ring, brilliantly framing the center gem. 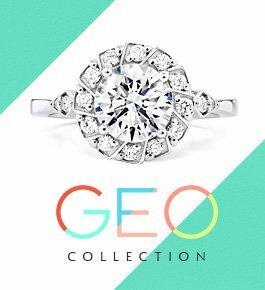 Evocative of days gone by, this vintage inspired engagement ring features sparkling diamond baguettes alternating with round diamonds and surrounded by delicate milgrain. The band is hand-engraved in a fanciful floral pattern, adding distinctive appeal. 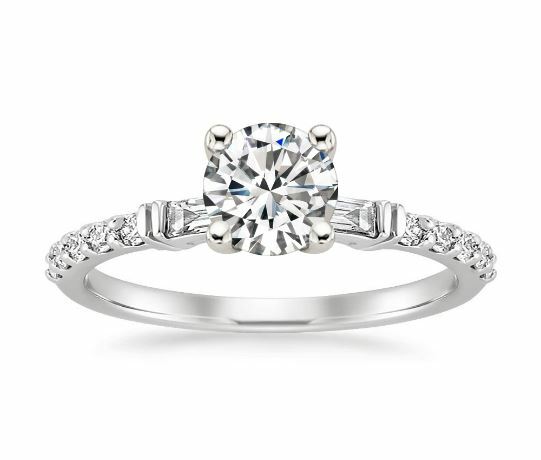 Alluring baguette cut diamonds sit on either side of the center stone in this chic and glamorous piece. 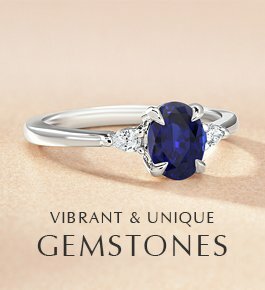 Bar-set diamond baguettes and round diamond accents frame the sparkling center gem in this chic ring. 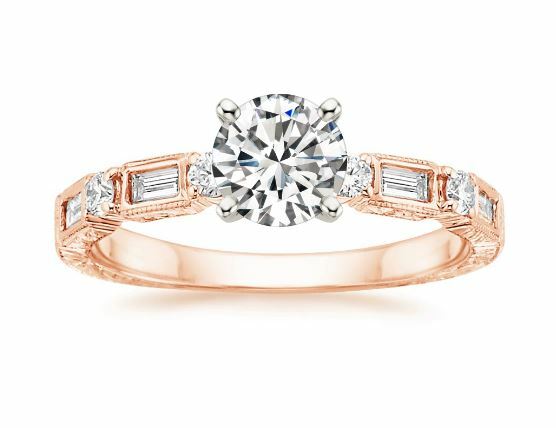 Two baguette diamond accents grace the shoulders of this vintage-inspired ring. 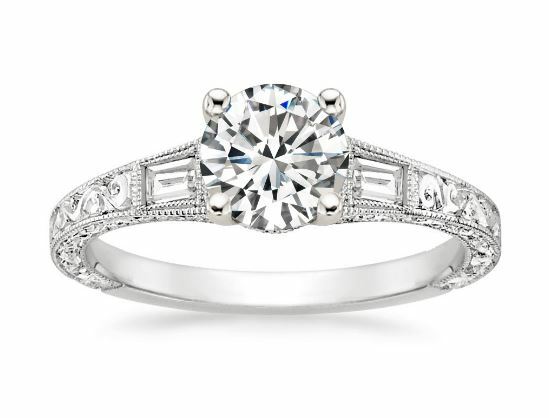 Bezel-set baguette accents create a look of shimmering beauty in this vintage inspired engagement ring. Both chic and sophisticated, this band features a baguette diamond set within bars of lustrous precious metal for a refined geometric design. This stunning band features a row of baguette cut diamonds secured in a channel extending halfway down the shank for eye-catching sparkle. 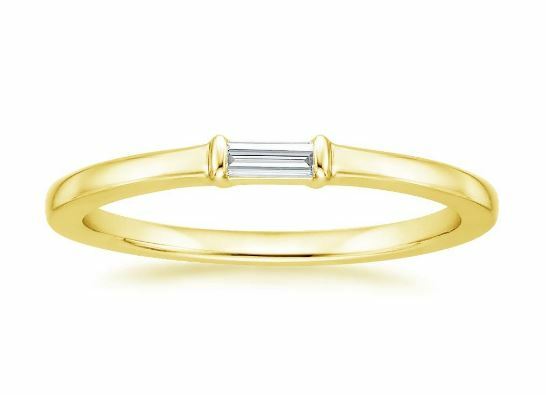 Irresistible baguette cut diamonds are bar-set across the top third of the shank in this sleek and modern wedding band. 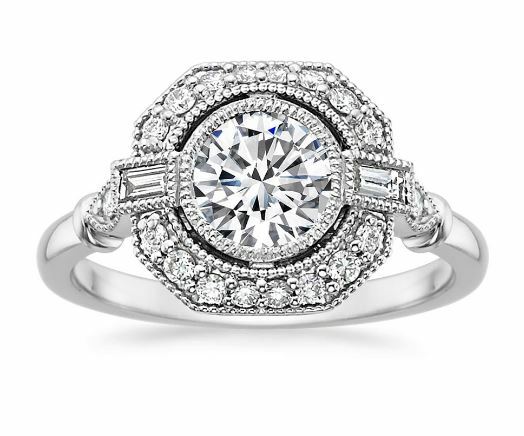 Sparkling diamond baguettes alternate with round diamonds in this vintage inspired band. A hand-engraved fanciful floral pattern on both the top and sides adds additional appeal. 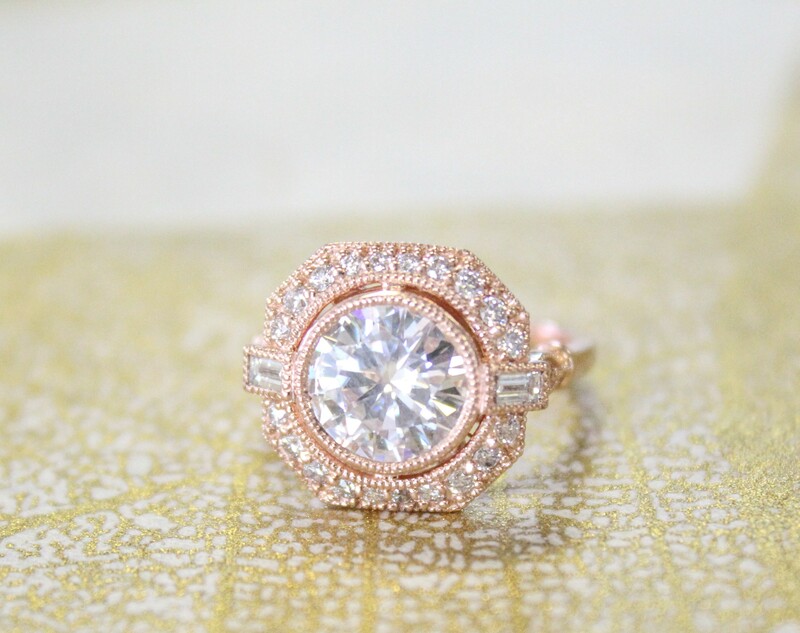 Do you like the look of baguette diamonds? Which style is your favorite? Let us know on our Instagram, Facebook, or Twitter, or in the comments below! Love all styles please send me more of what you’ve got I like the literature also. I love too have a beautiful diamond like this.